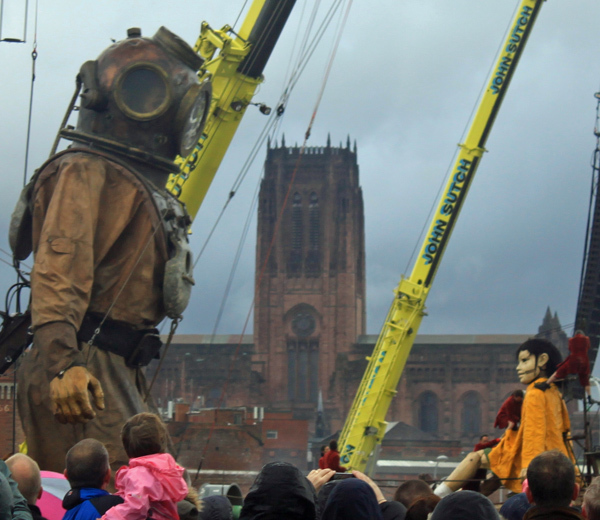 The third and final day of Sea Odyssey in Liverpool today. I’d planned on having a lie in today but I found myself there before it started. The weather was terrible with freezing wind coming off the Mersey and rain sheeting down. Despite that got some good pictures of the sleeping pair and once they woke up. Ineffectual marshalling then sent me and a fair section of the crowd down into the Albert dock where all the exits had been blocked or in the case of the bridge to the three graces removed. Got back onto the Strand ahead of the procession and watched them round the three graces. The crowds were now so big that I abandoned trying to get any more pictures. I did find a spot where I might have seen them sail off up the Mersey but it would have ment waiting for two hours on a rather exposed bit of the waterfront. Rapidly decided that I wasn’t that keen. Made my way back and watched them sail out of the Albert Dock (or to be more precise the top of Uncle and Little Girl’s heads). As I left to head home around 12:30 the crowds were still growing and people were still heading down to the waterfront from the City Centre. Sea Odyssey has been an excellent event and great fun.